There are baked seafood recipes galore - some of them you will find on these pages, but this method of baking small whole fish is one of my favourites. It keeps all the goodness and moisture in, allowing the fish to bake in its own juices and any flavourings you have added. Serve with buttered new potatoes and some plainly cooked green beans, peas or asparagus. 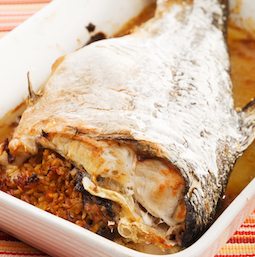 Some baked fish recipes suggest using mackerel, small bream, mullet, snapper in this way. 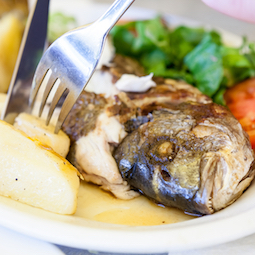 Any small whole fish will do if it's around 12 oz (350g) in weight. 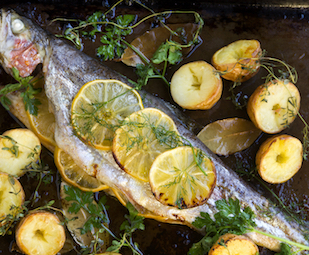 Follow this method which is a classic method of baking whole trout. Season the cavity of the fish with salt and pepper and brush with olive oil. Make greaseproof paper or foil squares - each fish will need to be double wrapped - then brush with oil to prevent sticking. Put the fish in the centre of the squares. Heat some oil in a pan and soften the onion and garlic. Add the parsley, dill and lemon juice, then divide the mixture evenly over each fish. Bring the edges of the parcels together and seal tightly. Place the parcels onto a baking tray and bake in the oven for 25 minutes if using paper or 30 minutes if using foil. 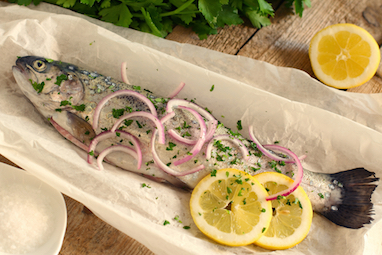 Trout en Papillotte is a classic method of cooking whole small trout or any other small whole fish. It keeps them succulent and they create lovely juices to accompany the dish. You can wrap in cooks paper or foil.